18m… 12m… 5m… more to the South, no… a step to the West. Yes… there, that must be it, under those rocks!!! YES, GOT it!!! This is pretty much how it feels for some 3 million people around the world every weekend, off day or whenever they have a free minute to head out into the woods, hills, malls – yes, even the malls. Armed with a GPS (Global Positioning System device) or a mobile app and a Waypoint downloaded from the internet, they are poisoned to find a little box, as small as the dice, but more often the size of a 35mm firm container or a lunch box sized Tupperware container containing a logbook and sometime even some additional items for swopping. These boxes called Geocaches with names like Under Pressure 2, Disconnected, or A bridge too Far, are hidden in the most unusual places, under park benches, in trees, on mountain tops, or in private post-boxes or under garden gnomes or rock piles. Currently there are over 2,5million caches hidden in 180 countries all over the whole world, 12’000 alone in SA, ~40 in and around Montagu. The game is called Geocaching and started in 2000 with the opening of the American GPS satellite system to the general public. 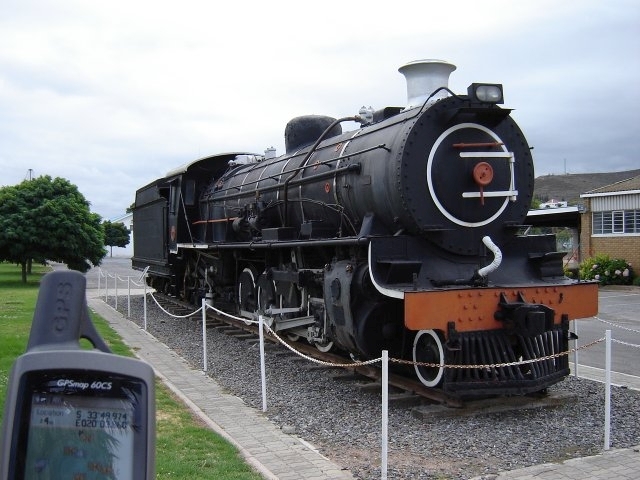 The first geocaches were simple sturdy ammo-boxes and over the years people downsized them to tiny containers called NANO caches, suitable to be hidden in heavy traffic areas like shopping malls, restaurants or bus and train stations. 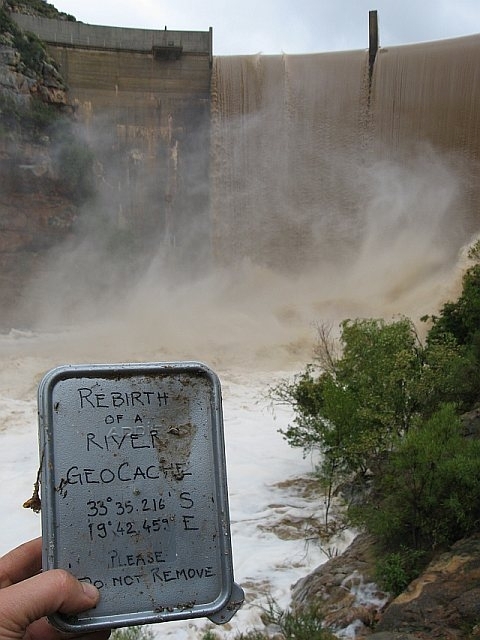 Other caches were so big they needed no log book, but a confirming photograph of the Geocacher in front of the object like a geological formation and then called EARTH cache. 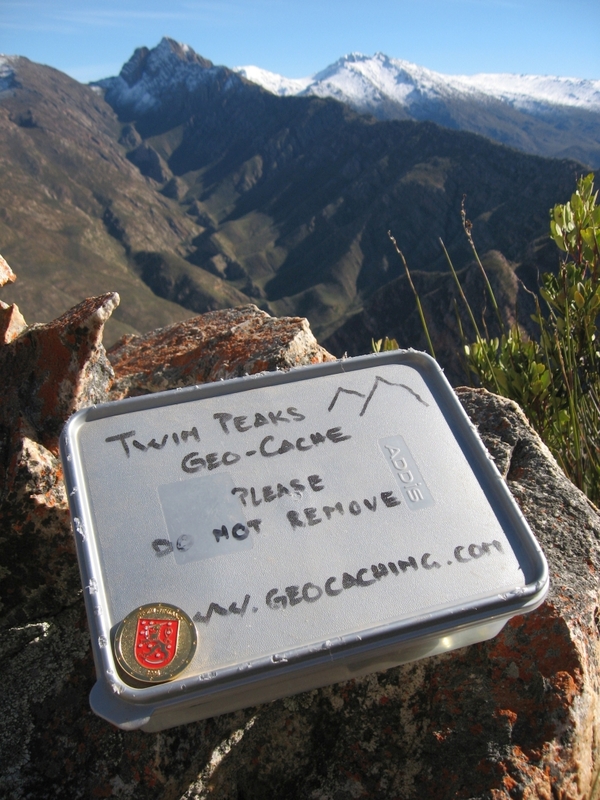 These caches are often very educational, as are those placed at historical monuments or plaques. 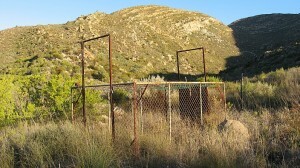 Did you know for instance that Montagu has at least 5 Boer war forts and where they are – Geocachers know! The caches are placed by the players themselves under strict rules, with great respect to the environment and permission of the landowners. 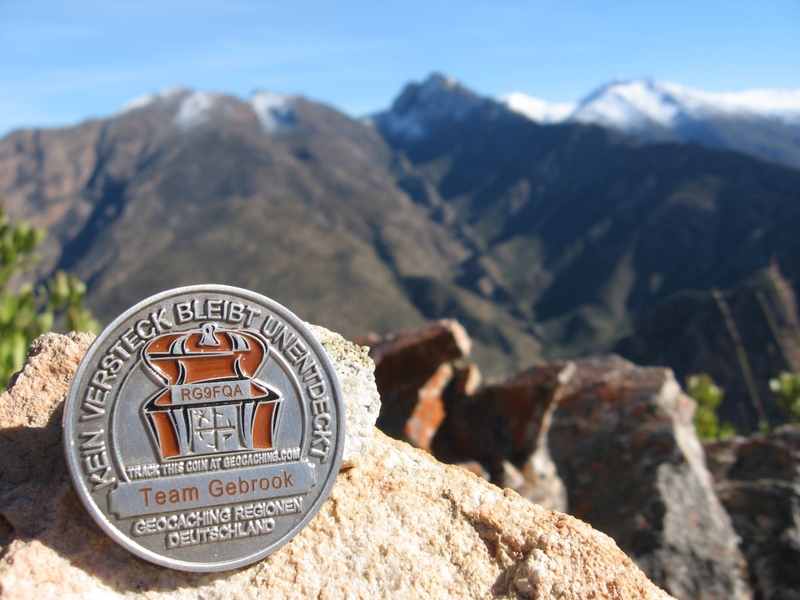 Sometime you might even find a GeoCoin (see above) or a Travelling Bug (TB) in the cache, those are traceable items which players released into the game to travel the world, some time with a dedicated mission like: Visit mountain summit caches all over the world, YES even Mt.Everest has a cache right on top, called: “Earth’s Roof – Mount Everest Peak”. Our personal Geocoin made it all the way to the Ramat Razi’el in the Judean Mountains before getting lost back in 2011… another TB called “s’ Geise Glöggli – The Bell” travelled 37334.5km so far and is currently in North Carolina. 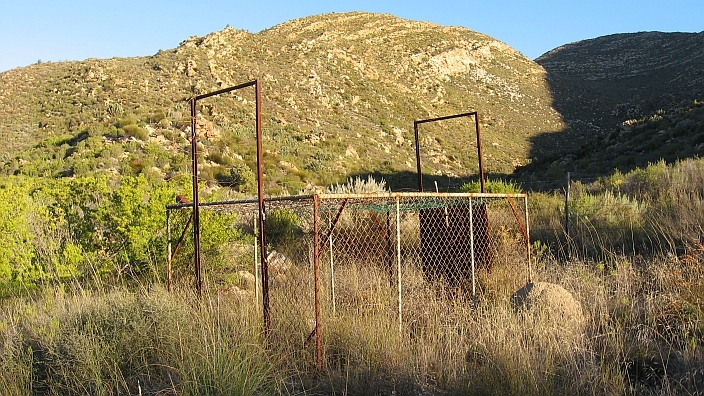 SO, if you love to spend a whole weekend geocaching and never step into your car, head for Simonskloof, we currently have 10 caches within our boundaries and another 8 within easy reach. So there I took them down that little contributory to the Nuy River, where I frequently spot Leopard tracks when taking guests kloofing. Nothing that day, well typical… But to my amazement the experts had a much simpler location in mind anyhow! 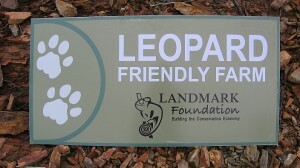 So before we returned to their 4×4, I showed them the old leopard trap on the edge of the orchard. The trap must have been used last when the trees were planted in the 1970’s but its trapdoors got burned in the many bush fires this mountain has seen over the many years and so rendered useless – or leopard friendly 🙂 It also is unusually big, was Ziggy’s comment the normal size is a quarter of this one… that way the leopard once caught will not run wildly around the cage and charge at the approaching person and thus hurt itself – makes sense. 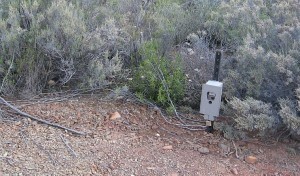 Back down at the 4×4, Carolyn quickly got to work and installed the camera trap nearby where they sensed the leopard would walk past. The batteries should last a month, so let’s see what the lens will pick up. We’ll definitely keep you posted! 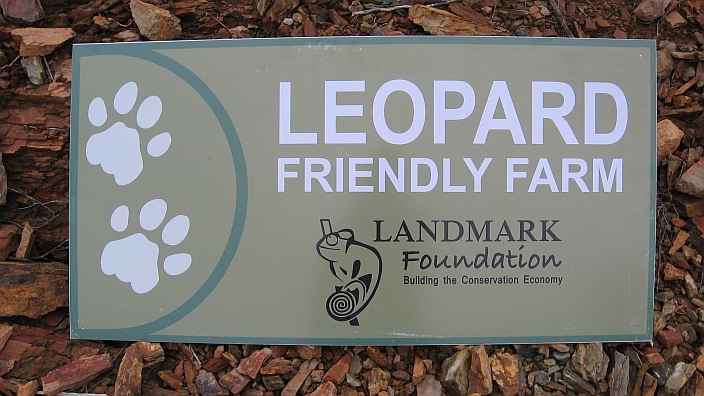 Oh and for those “Geocachers” of you, go and check: “Leopard Friendly Trap” GC3NXYX it’s Matata’s latest cache, in admiration of the good work of the Landmark Foundation.